Billed as the next generation in family entertainment, Big Al's in Vancouver, Washington, boasts more than 60,000 square feet of family-oriented fun. Big Al's features 30 traditional bowling lanes, 12 lounge-style bowling lanes, five private party rooms, a lounge, a 4,000 square foot arcade, and a sports bar. The experience in each space is enhanced with dynamic audio and video systems. Video plays a very important role in the Big Al's experience. A variety of large displays are used for off-air and closed circuit programming, scoring, and DVD media content. 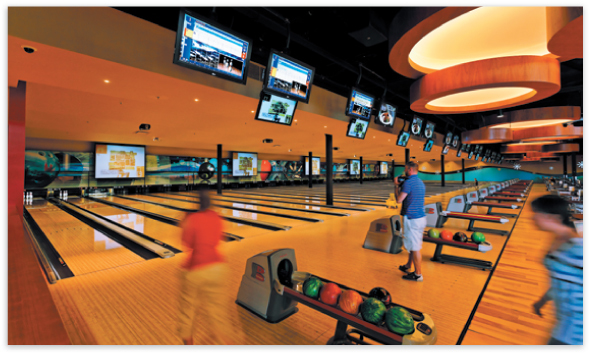 Each bowling lane features two 37" LG LCD displays used as scoring monitors and 42" plasma displays that show high definition music videos from any of three Brunswick Entertainment Network channels or sports and entertainment programs from one of 12 satellite receivers. That's a total of 126 displays for the lanes alone. When the lights go down during Galaxy Bowling nights, projection screens lower into place between lanes to provide music video content via several DLP video projectors. Forming the backbone of the switching and signal distribution for this large facility is a complement of Extron products, from matrix switchers to signal processors and distribution amplifiers. As with any large venue AV installation, careful planning was paramount to Big Al's success. Management at Big Al's selected CompView, headquartered in Beaverton, Oregon, as the integrators for this complex project. When it came to choosing AV suppliers for this large scale project, Eric Willard, CompView Project Manager, says that Extron was his first choice for switching and signal distribution. "Extron simply has the quality and reliability we look for," he says. He adds that although this type of project represented uncharted territory for CompView and Kirkwood & Kirkwood Construction, it was an uncompromised success for all three parties. Rather than use a single, large wideband matrix switcher for all signals, CompView elected to divide high resolution and low resolution switching. "This decision was based mainly on economics," Willard says. "We could have used a much larger CrossPoint, say a 48x48, but with numerous low resolution sources to contend with, we decided to split the signals by high and low resolution. This allowed us to procure a 24x24 CrossPoint for high resolution routing and then use a MAV Plus to handle all the S-video signals." Big Al's uses the Extron CrossPoint 450 Plus 2424 for all of the high resolution video signals from the DVD players and satellite television receivers. The MAV Plus 2424 SV handles all S-video signals from the various low resolution sources, including the television tuners and DVD/VCR combos. "We knew that even with all of the I/Os filled, the CrossPoint and the MAV switchers would provide ample bandwidth," Willard says. In order to carry through with the plan to use just two matrix switchers, one for high and the other for low resolution, CompView chose the Extron VYC 100N Composite Video to S-Video Decoder to decode the composite video signals originating in the family dining and private party rooms to S-video. These S-video signals were then routed to the MAV Plus 2424. Without the VYC 100N decoder, a separate composite matrix switcher would have been needed. One of the key objectives of the project was to have centralized control of the AV systems from the main desk and the sports bar. "With so many devices, we realized that control was going to be one of our biggest design challenges," Willard says. The control system was set up using network cable throughout the facility. All of the plasma displays and projectors are connected via RS-232 to Extron IPL T S2 and IPL T S6 IP Link® Ethernet control interfaces. Commands from the third-party control system are repeated and broadcast via IP Link to all the plasma displays and projectors. Extron MDA 3A, Mini Distribution Amplifiers provide audio signal distribution within the facility's sound system. "We chose the MDA 3A because of its easy-to-conceal, compact design and its bullet-proof reliability," Willard says. Balanced stereo audio signals from the different sources are routed through the CrossPoint 450 Plus to zone-specific audio systems. Unlike single-attraction leisure facilities, such as arcades or bowling alleys, family entertainment centers, like Big Al's, rely on multiple attractions, including arcades, bowling lanes, sports bars, and private party capabilities to attract a wide variety of patrons and to draw them from one area of the facility to the next. Sophisticated AV systems play a crucial role within these centers by providing dynamic sights and sounds that can be tailored to the specific needs of each zone or room. "Behind the scenes, Extron provides all the signal switching and distribution needed for this huge facility," says Willard. "In the end, the AV really creates a fun atmosphere that keeps Big Al's customers engaged and entertained." Over one hundred displays line the bowling portion of Big Al's - one of several attractions inside this massive facility..